In February, I participated in a “yoga challenge.” Now, mind you, I am not the yoga type, but as I only recently started practicing it, I found that I absolutely love it. I used to dread exercise, but it’s really true that finding something you like to do makes such a difference. I don’t necessarily like how I feel while doing yoga, but I love how I feel when I’m done. After that shivasana (the rest at the end to allow your body to integrate the practice), I feel great. For the yoga challenge, I was able to choose to participate either 16 days or 28 days in the month. I selected 16 days and all in a row. I have never done that much yoga before. I could go to any of the classes and they would range from “boot camp” to “hot yoga” to “restorative yoga.” I thought I would choose all of the easy classes to complete the challenge, like restorative yoga or deep stretch, however, with my schedule, that wasn’t to be the case. A flexible body needs a flexible mind. I had to be flexible with the class schedule that I chose and to rearrange my schedule, so I could accomplish that. 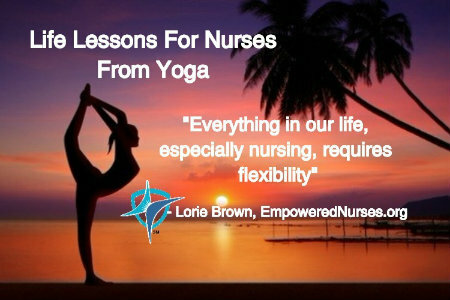 The flexibility provided me great insight to my life and connection to my body. We have all the time we need to do whatever is important to us. I was able to move heaven and earth to get yoga into my schedule. Take the time to nurture your body and soul. With commitment and persistence, we can do anything that we desire. For me, I woke up at 5:15 a.m. a couple of times just to make sure I was able to complete my yoga for that day’s class. I learned not to let my life be ruled by emotions. Some days I didn’t feel like going to the yoga class because I was tired or possibly felt unmotivated. It was all I could do to get out bed and get to the class. But once I got there, it was great. Not allowing ourselves to be ruled by our emotions and getting on with our projects anyway was a great lesson. “Whether you think you can or think you can’t, either way you’re right.” Several days I was so sore that I really did not want to do yoga. But I thought of that Henry Ford quote and decided to go anyway. I was surprised on one occasion to find that my soreness actually felt better after the class. The lactic acid causing the soreness was able to be absorbed by my body during the class, relieving my pain. I am not perfect. It’s ok to be who I am and do the best I can. Some days are easier than others. I allowed myself to give myself grace on the hard days. Focus on the now. Each moment is a now. Focusing on something that happened in the past or thinking about the future does not serve me. Go with the flow. Each class, like life, is different so just go with it. Breathe! We so often walk around on “auto pilot” with our autonomic nervous system controlling our heart rate and respiration. Consciously, focusing on your breath is a basis of life and does the body good! Think about how these life lessons will help you in your nursing practice. If you’re going for a promotion, commitment and persistence pays off. If you want to continue your education, think of the Ford quote: “Whether you think you can or think you can’t, either way you’re right.” Everything in our life, especially nursing, requires flexibility. We have all the time we need to get done everything we need to accomplish. That’s a great philosophy to have in nursing because we are so pushed to get everything done, but thinking we have the time to do it requires us to change our mindset around it, which certainly helps. I would love to hear from you on how you might be able to use these lessons to help in your life and your career.